The Ides of March (15th) was a bad day for Julius Caesar. The Roman general who rose to the pinnacle of power in 44 BC discovered that being "King of the Hill" was a deadly business. Indeed, the fear of a monarchy and thus the loss of the Roman Republic, guided a dagger into his heart on that portentous day. On the 2050th anniversary of his murder by a protégé, Brutus, and other friends, Latin and Classics teachers across the country will use ancient coins to teach a realistic history lesson. Of course there are no photos of Julius Caesar or his assassins, but lifelike portraits do exist on ancient coins. One silver coin with the inscription EID MAR, actually commemorates the murder of Caesar as being a patriotic act! Zee Ann Poerio, an elementary school teacher at St. Louise de Marillac school in Pittsburgh, frequently uses genuine ancient coins to capture the imagination and inspire the interest of her students. The thrill of holding an authentic contemporary coin brings history lessons alive. 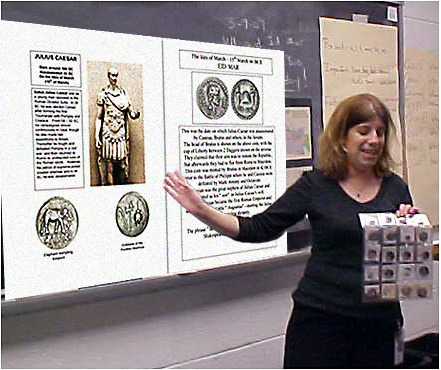 Poerio, who recently was awarded a $2,500 technology grant from Best Buy, Inc. for her innovative use of ancient coins in the classroom, sees them not only as a tangible link to the past, but as the perfect tool for cross curricular connections between History, Literature, Art, etc. "I've been telling my students to Beware the Ides of March for several days. They don't know that I am plotting a hands on history lesson with ancient coins!" 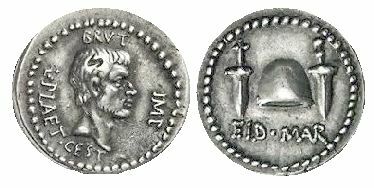 At Irondequoit High School in upper NY state, teacher Susie Scoppa explained that "Using the image of the EID MAR coin is my teaser for reading an account of Caesar's death from a text on the Ides of March." 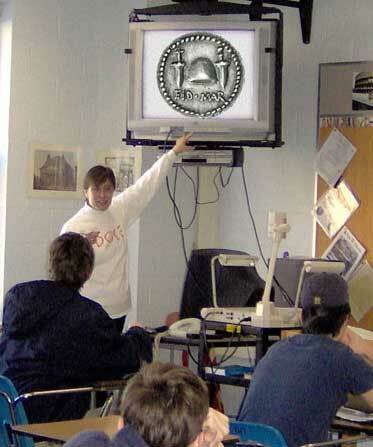 When shown an image of the coin on a classroom monitor, one student remarked "You mean they really made a coin celebrating killing Caesar? NO way!" Teacher Jo Green at Westlake High School in Austin, Texas is one of hundreds of teachers across the nation who use educational materials generated by the volunteer collector organization Ancient Coins for Education. In addition to assistance with lesson plans, this non-profit group provides genuine coins and other program enhancements to participating schools. The phrase "Beware the Ides of March" actually comes from Shakespeare, but it has become synonymous with the avoidance of treachery and a warning to opponents of liberty. Ancient coin collectors in the United States can empathize with Caesar to some degree as the 600-year-old hobby is facing its own perils in the form of anti-collector legislation and controls. The non-profit Ancient Coin Collectors Guild, a collector advocacy group formed to safeguard collector rights, is a strong supporter of ACE educational programs and independent scholarship.